Insertable Electrodes are the element that passes the output from a power box to the subject, once inserted. All of our electrodes are created to offer the best in comfort safety and durability. BiPolar Electrodes have two contact points, Monopole electrodes have one contact point and need to be used in conjunction with another monopole electrode. 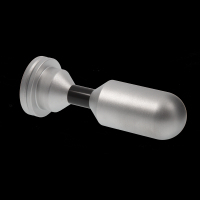 Insertable electrodes are obviously designed to insert into the body. 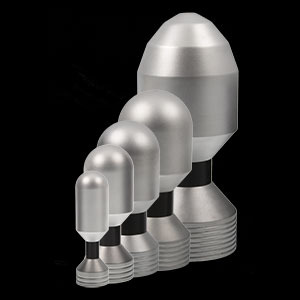 Our exclusive range provides creations from the tiny 1" Micro right up to the massive and world record holding 4" 3.6Kg Decimator. and includes such delights as the Red Collection, a group of perfectly formed highly polished electrodes that feel as good as they look. Looking for something a little different? 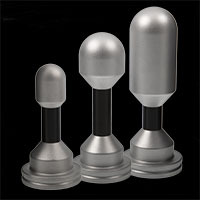 Electrowands™ are polished monopole electrodes. They can be used for insertion or play over the surface of the skin. Another one of our exclusive designs and again covered by a lifetime guarantee.